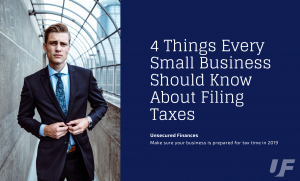 As this year is coming to a close, many small business owners are examining their financials, and planning for tax time, which is fast approaching. If you are a new small business owner, this could be a confusing and overwhelming task, but we have some information that can help you navigate the process. There are many advantages to having your own business, but there is also a brand-new bundle of responsibilities – paying your own taxes is one of them. If you are new to owning a business, this may come as a surprise, but certainly you are up to the task! Self-employment tax is comprised of Social Security and Medicare taxes and is paid by those whose income is not subject to employer withholding. This means that you are now responsible for both your portion of the self employment tax, along with the half that is typically paid by an employer. Deducting the employer-equivalent component of your self-employment tax should be done routinely, to lessen the burden when tax time comes around. As a business owner, you can claim half they pay in self-employment tax as an income deduction. Make sure you are also taking advantage of business and startup expenses to limit net income and your self-employment tax burden. If this is all entirely new to you, and a little overwhelming, you can hire an advisor to help you to create a workflow that will make everything easier to navigate throughout the year and leading up to tax time. Not all small businesses endure the same tax burden. Depending on the legal entity that you elect to form can have an incredible effect on your tax liability over the years. From sole proprietorships and LLCs, to S corporations and partnerships, there are various business types, each with its own benefits and limitations. Make sure you are performing efficient research to determine what the best option will be for your business. Small business owners must come up with methods of stretching their financial resources, especially when you are starting a new business. From raw materials, to employee salaries, to business rent, to utilities, the various operational costs of a startup can be overwhelming. Fortunately, as a new small business owner, you may be able to deduct a number of expenses in order to minimize your tax burden while maximizing company profits. According to the IRS, businesses can deduct expenses deemed both ordinary and necessary. Ordinary expenses refer to those that are common to your specific trade, meaning what’s reasonable for one company may not be relevant for another. On the other hand, necessary expenses are helpful (but not always obligatory) in your field. Some of the most common business deductions include rent on a business or home office, supplies, furniture and equipment, such as computers, copiers and fax machines. Additionally, many small businesses can deduct costs associated with providing healthcare benefits for their employees. As a new small business owner, you probably know that it’s important to pay taxes accurately and on time. However, you may not realize that self-employed persons are responsible for making quarterly estimated tax payments throughout the year. While startup founders are excused from making estimated tax payments in the first year of operation, they are responsible for submitting accurate quarterly payments in the years to come. Business owners filing as sole proprietors, partners and S-corporation shareholders must all make estimated tax payments if they anticipate owing $1000 or more for the tax year. Filing estimated tax payments for the first time? You may want to use last year’s income, tax credits and deductions to calculate your expected tax burden. Business owners who fail to submit at least 90% of the taxes they owe may be subject to penalties, so perform your due diligence to ensure you’re in the clear. What Does This Mean for Loans? If you are a small business looking to acquire a Small Business Loan or a Startup Loan, there are options for obtaining your funds, even when you are writing off a large portion of your income. Our No-Doc Loan is a loan based off stated income. Stated income means your true income. The total income you made for the year. Checks, cash, credit cards and any other income that you made. Since its a stated income product you will not have to prove financial documents including taxes, w2’s or pay-stubs. Want to learn more about how these types of loans can work for your business? Give us a call!